"Time Magazine reports an interesting case of high-tech graffiti. It seems that a couple of Intel engineers working on the design of a recent version of the Pentium microprocessor included a message that describes their feelings about Bill Gates, president of Microsoft, a good corporate pal of Intel's. 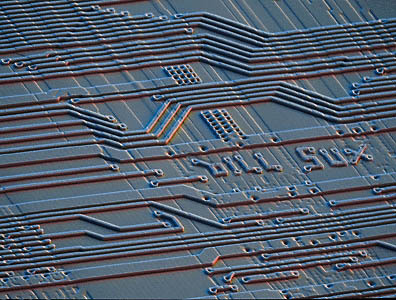 When a portion of the Pentium chip is examined under a powerful scanning electron microscope, the phrase "bill sux" is clearly visible, etched into the surface of the chip. The "flaw" in the chip was only discovered by accident well after the chip was released into the market, too late for Intel to prevent the chip from being used in the manufacture of tens of thousands of PCs. Intel says that both engineers responsible were former employees of Motorola, makers of the chips that are the heart of the Apple Macintosh. Both engineers have since been fired by Intel." Source: Mac OS Rumors site, july 30th 1998 (original article in Mac OS Rumors Archives). It has been known after all that it was a hoax. The picture was modified with Photoshop. What a pity, I liked it ! Remarks, problem ? Write me !